Staff are committed to writing at least 1 per day. A copy of the form is below. Upon arrival to the office, the student is greeted with high fives, impromptu dancing and excitement by admin. and/or the office staff. Students then call or email a parent or loved one about why they are in the office. Students earn Hornet bucks to spend and House points (towards their class reward). Students hang up their referrals on a “brag board” outside the office. After 1 week, they are sent home. Positive referrals are logged to track who is/is not receiving awards and to monitor 4:1 positive-to-negative ratios. In your planning, consider opportunities for students, bus drivers, café workers, etc. 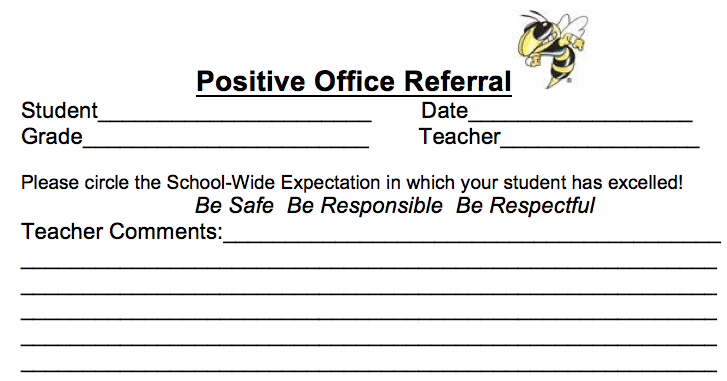 to write positive referrals, as well as staff-staff positive referrals!